My friend Nat prepares the most fantastic dinners. 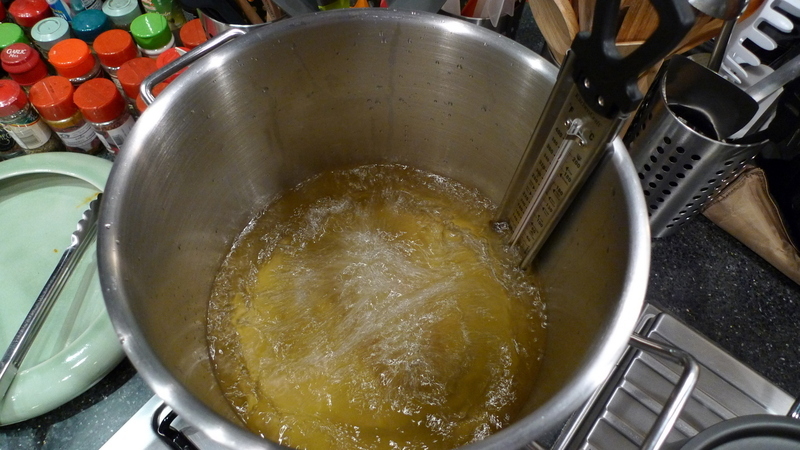 A few weeks ago he bounced an idea off me: sous vide unsliced bacon and then deep fry it. 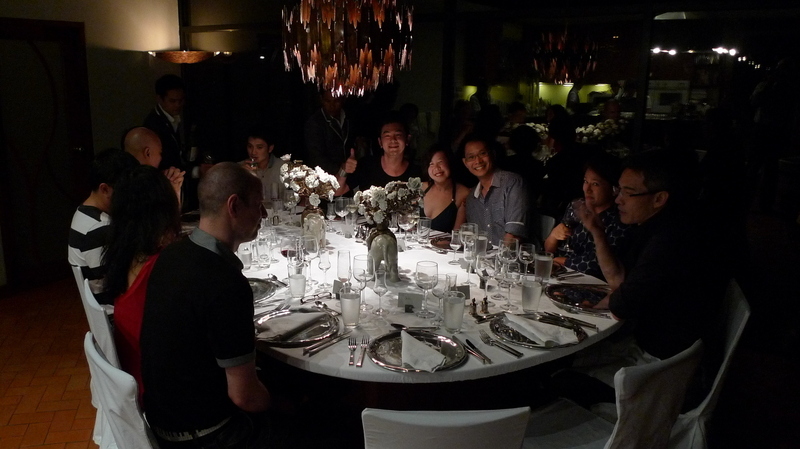 Before I knew it, a date was set and a dozen guests invited. 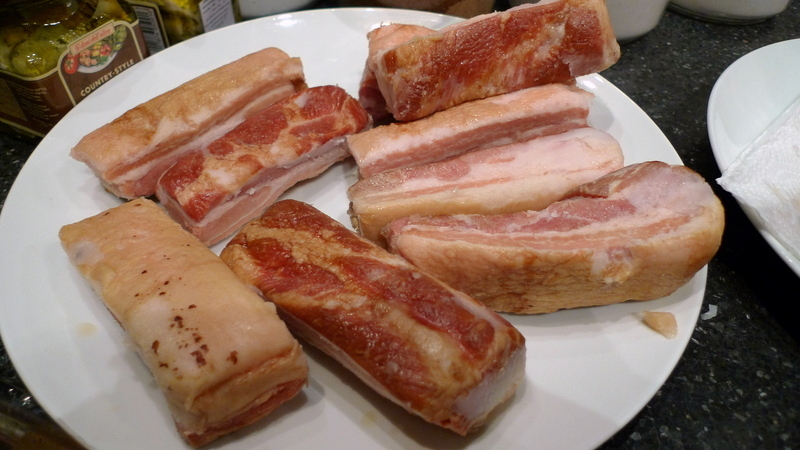 Nat was at the market and they had a whole, uncut bacon – smoked pork belly. He bought it, certain that it would make an interesting sous vide main course. 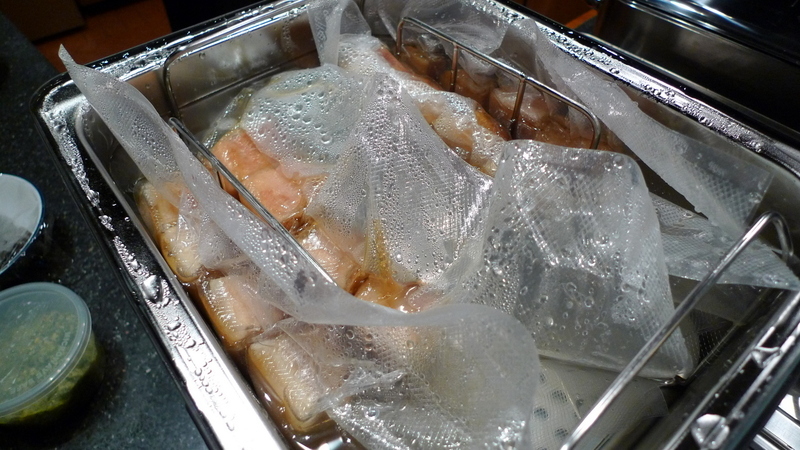 Sous vide cooking is a technique where the food is vacuum sealed in plastic bags which are then cooked in a water bath for long periods at a relatively low temperature. Not certain how long would be ideal, he ran a test batch with three bags, pulling a bag out every 24 hours to check the texture. Seventy-two hours was perfect. 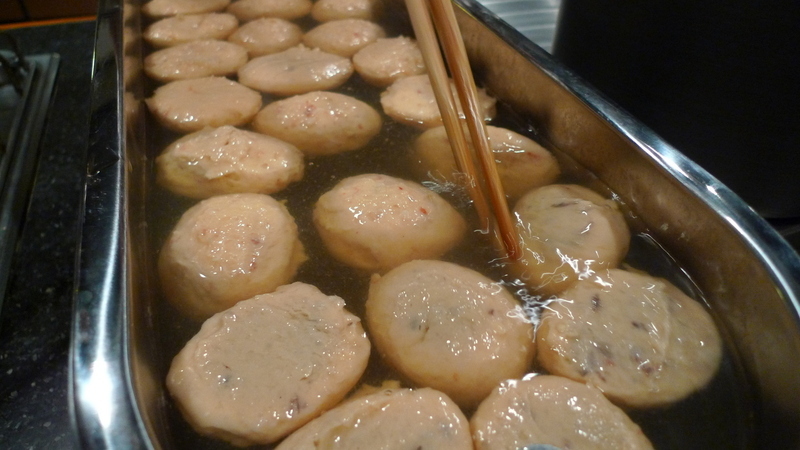 After pulling the bags from the water bath, they were plunged into an ice bath to halt the cooking. Once cooled, the slabs of bacon were removed from the bags and patted dry with towels. The final step, to ensure a nice, crisp exterior, was to deep fry the pieces of bacon for a few minutes. 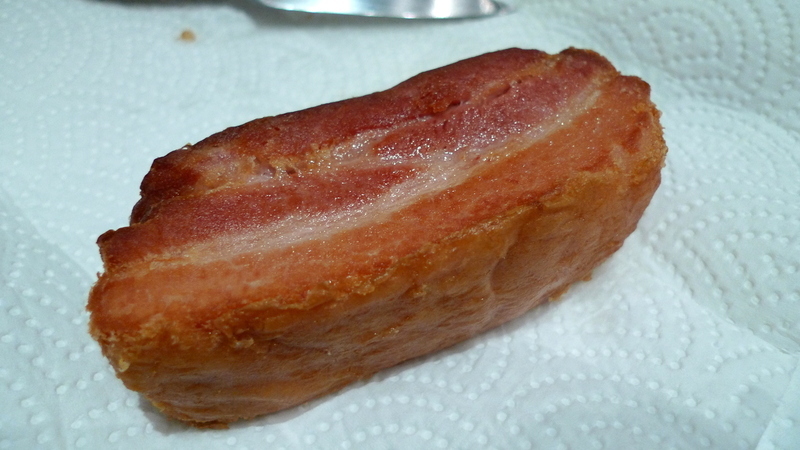 The end result, a soft, silk chunk of bacon with a crispy exterior. The day before dinner, Nat asked my suggestions for a sauce. I suggested a lychee sauce since it was lychee season and the astringency of lychee would cut through the richness of the bacon. What I received for my suggestion was the assignment to cook the sauce! 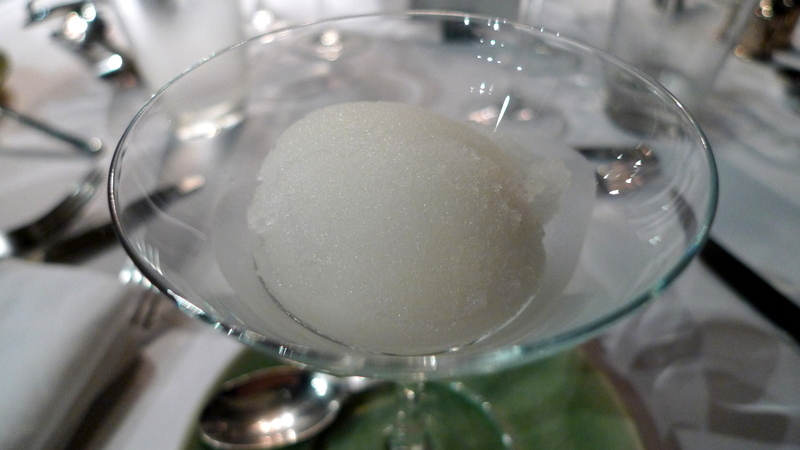 Once I arrived, I started turning fresh, seeded lychees through a food mill in order to extract all the juice. This was cooked in a pot with chicken stock and chopped onions and allowed to cook for an hour before I seasoned and thickened the sauce. 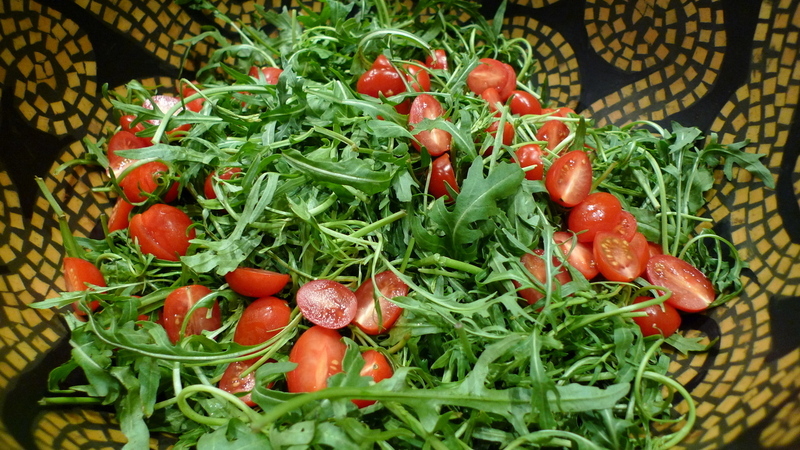 A nice rocket and tomato salad was prepared to garnish the dish. Bitter greens in a vinaigrette would contrast with the rich bacon and sweet/tart lychee sauce. 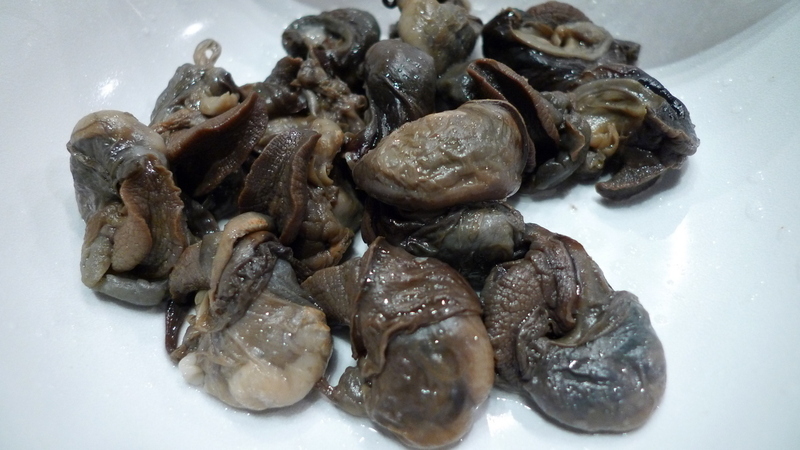 One item was sitting on the counter, waiting to be turned into amuse bouche – appetizers. Do you recognize these? 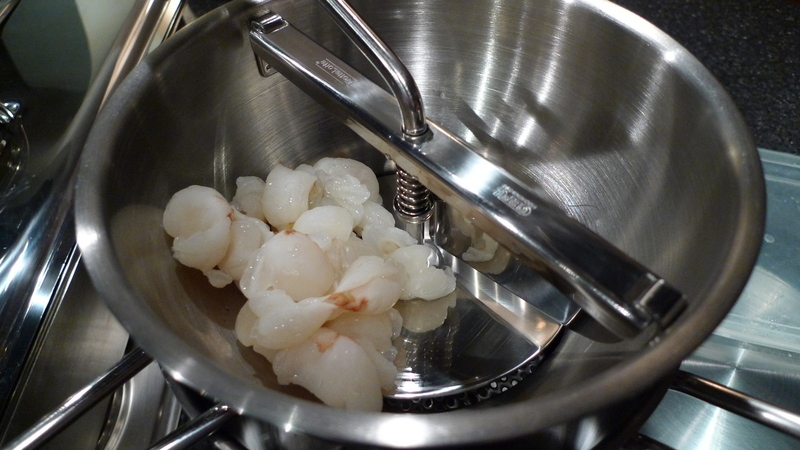 Poaching on the stove is a dish of tiger prawn quenelles, made by taking a choux paste (same one you use for cream puffs) and mixing it with finely ground, raw prawn meat and seasonings. As usual at Nat’s house, dinner brought together a wide variety of guests, people with different backgrounds, occupations, and interests – all of whom share an appreciation for good food. 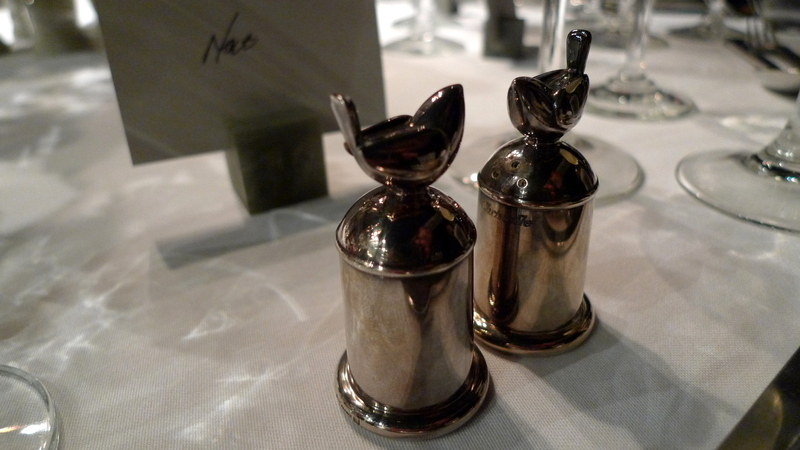 Charming salt and pepper shakers. 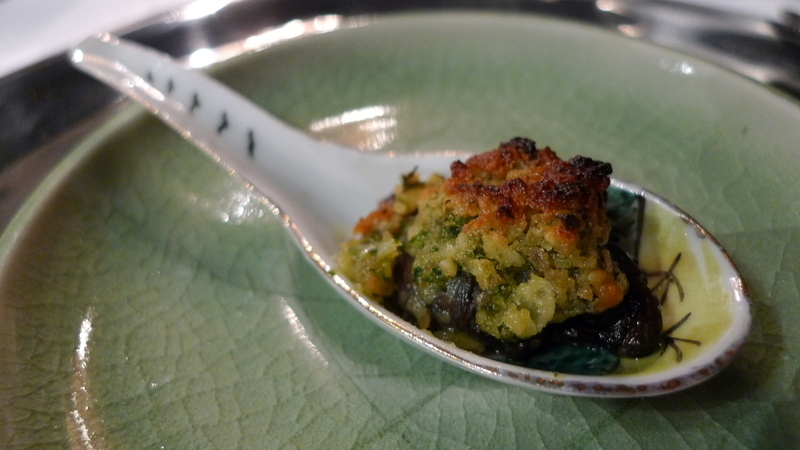 Amuse bouche: escargot in garlic crust. Very tasty! 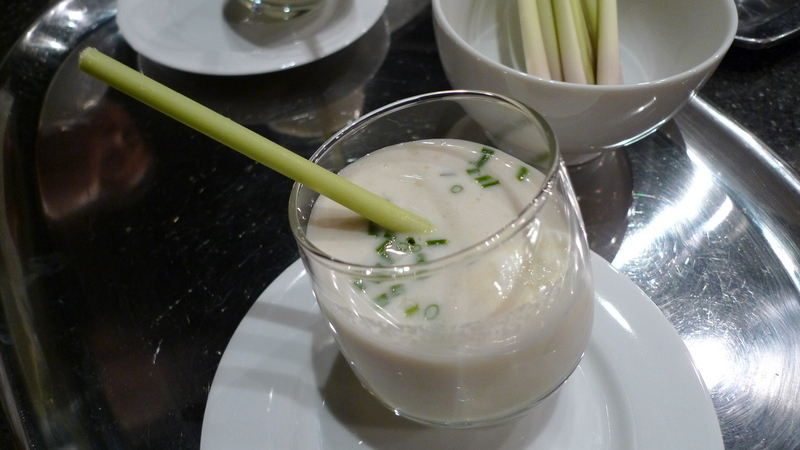 Soup course: chilled leek and lemongrass soup. The lemongrass was very subtle, just sneaking up into your nose when each sip of soup was already swallowed. 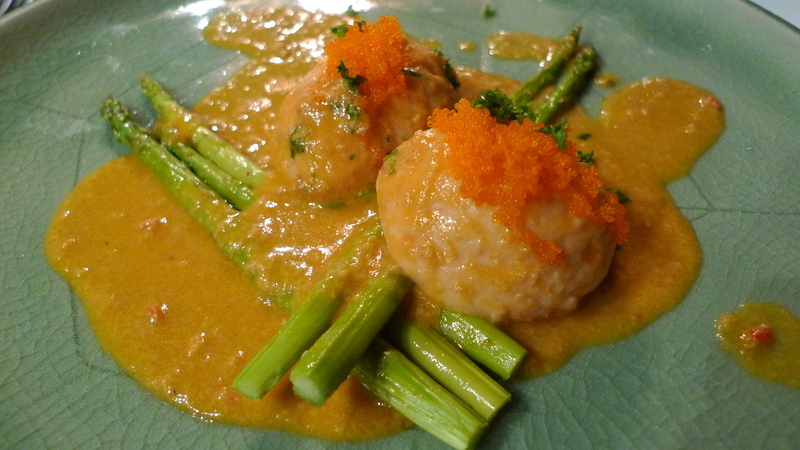 The tiger prawn quenelles served with a prawn roe sauce and steamed asparagus. Very light texture with rich flavor. 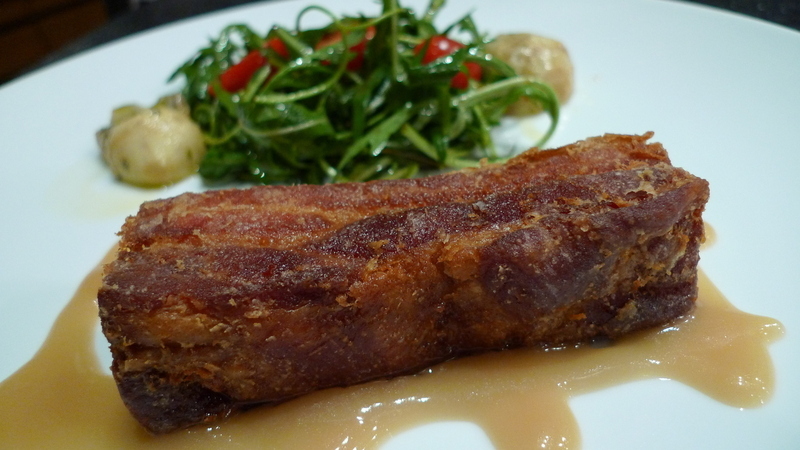 Main course: Deep fried sous vide bacon with lychee sauce served with a rocket salad with soy vinaigrette. Alas, the plate was a little cool and my sauce thickened a bit too much by the time I took this picture. Nonetheless, the meat was very tender and the sauce’s flavors worked nicely with it. Of course, the serving could have been a third this size and we would have been fine! 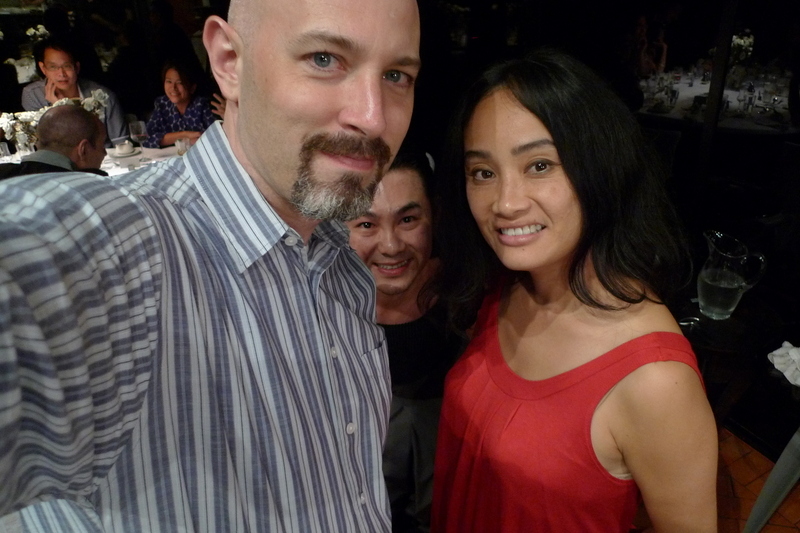 Linda and I pose for a picture mid-dinner, only to discover a moment later that Cha had inserted himself into the shot! 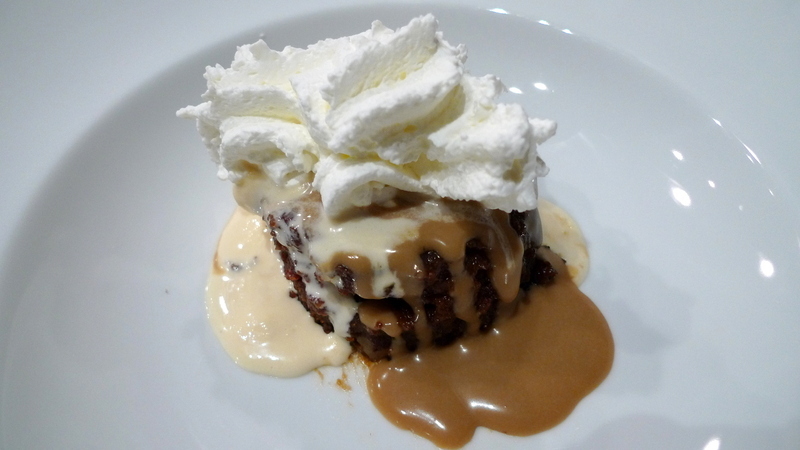 For dessert, sticky toffee pudding with a toffee sauce and homemade yamazaki ice cream. Decadent! This entry was posted in Uncategorized and tagged Bacon, cooking, Dinner, food, Nat, Pork, SousVide by christao408. Bookmark the permalink. amazing dinner! looks like he put a loooot of hard work into it and everything seems lovely!! i like the idea of lychee sauce.. you always see pork with orange, or apples, for that tart/sweet combination, but you dont really ever have pork with lychee 🙂 i wish i could cook with you one day! looks amazing! mm… bacon with a lychee sauce is a great idea. and, my doctor said i need to gain weight, so this would be a great way to do it! i don’t have a sous vide though, so i’d have to think up a good alternative. Darn you Chris! I should not read your blog anymore before dinner. Now I’m super hungry for bacon! I saw a show on Sous Vide cooking. Quite fascinating. Even more fascinating are such evening with so many people. Should be a good opportunity to meet interesting people. Masterpiece. (It’s not the Madeira talking)Sous vide. Absolutely fascinating.Photos. Elegant prose. Erudition. Your blog is everything a blog should be. Tried to Rec. Didn’t seem to work. Who says you can’t visit heaven?? This post was a wonderful place to visit tonight. Thank you for all the hard work that went into putting it together for us on Xanga. Food looks great ! Its work out time ! First of all, I am so happy you are posting. That means you must be feeling wonderful after the surgery. I was just going to send you an email asking how you were feeling.Secondly, you made a Muslim woman drool over this exquisite meal. OMG! It looks phenomenal Chris. Absolutely making me drool. Yummy! TY for sharing. @Fatcat723 – hahahaha – oh Rob, I would have loved to share this feast with you, we would have redefined gluttony. 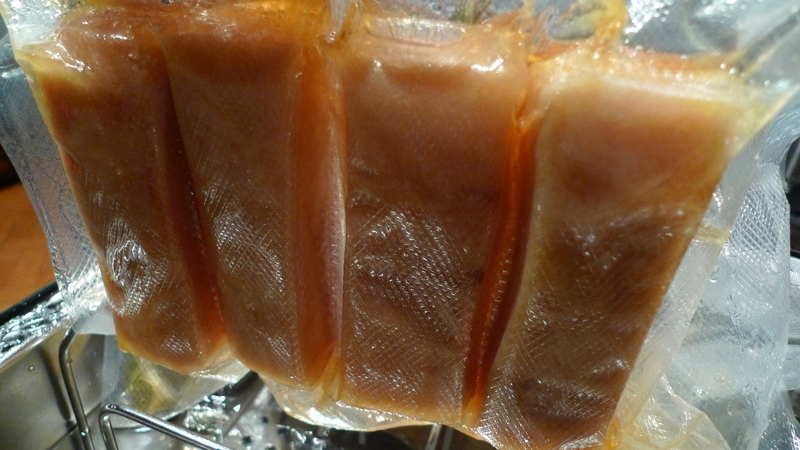 @kunhuo42 – I wonder if you can poach it in duck fat or pork fat? I’m not in your league at all… this is just incredible. 100% total gourmet meal. i had “sous vied” style cookery back many many years ago. i can’t even remember what i had. yummy – Deep fat fried bacon – looks very good.